The annual fair of Kaila Devi, (Mahalakshmi or the goddess of wealth) will begins from 28th April 2014. 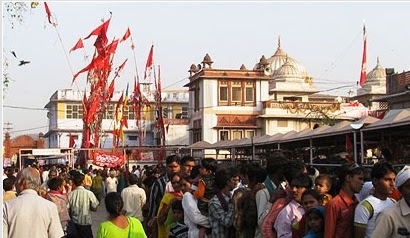 Kaila Devi fair is held at the village Kaila (24 kms to the south west of Karauli) in Karauli district in the month of Chaitra (Mar‐Apr), lasting for a fortnight. The temple of Kaila Devi is located on the banks of the Kalisil river in the hills of Trikut, 2 Kms. to the north‐west of Kaila village. Another attraction is the small temple dedicated to Bhairon, situated in the courtyard and facing the shrine of Kaila Devi is a temple of Hanuman locally called 'Languriya"
Approximately 2 lakh devotees gather during the fair. The ritual of Kanak‐Dandotis is observed by staunch devotees. They cover a distance of 15 to 20 Kms to reach the temple, not on foot but by lying prostrate, making lines with their hands in that position, advancing up to the line drawn and repeating this procedure till they reach the temple. While some eat food and take rest during the journey, others endure the rigours of the ritual. Groups of Meena tribesmen arrive in a spirit of gaiety – dancing, singing and creating a lively atmosphere. The spacious courtyard becomes the venue for dances and songs sung in praise of the guardian deity. The nearest railhead is Hindaun at a distance of about 48 Kms. Shri Mahavirji is another railhead of the Western Railway near Kaila. The site is approachable by well maintained roads from Karauli, Hindaun and Mahavirji. During the fair, the State Transport as well as private operators provide bus services keeping in mind the huge inflow of pilgrims.